On 61st Street and Cottage Grove, not far from the Cottage Grove Green Line stop, life is flowing back into an historic part of Woodlawn. Woodlawn Park, formerly the site of 504 units of Section 8 housing then known as Grove Parc Plaza, is gradually being reopened as a mixed-housing area, most recently with the completion of sixty-five senior living units last October. 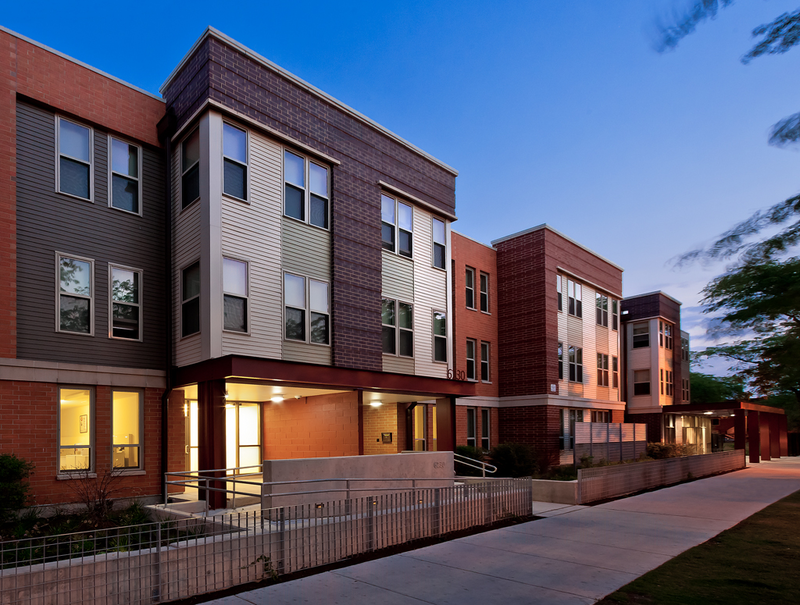 With more than four hundred units now open, the new apartment complex represents a fruitful, if complicated, attempt at new development in Woodlawn. On the one hand, previous tenants in the Grove Parc projects are being offered what appear to be better-managed and more various housing options. On the other hand, Woodlawn residents who value home ownership over renting worry about increased crime, destabilization of a tight-knit neighborhood, and a return to the more unstable times of the 1990s and early 2000s. Grove Parc Plaza was established in the sixties as Section 8 low-income housing, but it’s passed through many hands since then. In the nineties, after a long period of decay, it became a key area for the Woodlawn Preservation and Investment Corporation (WPIC), a local nonprofit based around housing and general redevelopment. Grove Parc was part of the group’s efforts to rehabilitate low-income, government-subsidized housing, with the involvement of famed developer and activist Reverend Leon Finney Jr. However, a series of failed attempts to outsource management of the property to different private firms led to a gradual decline in quality of living. In the meantime, Finney was repeatedly accused of embezzling from his other nonprofit, The Woodlawn Organization. By 2005, Grove Parc had once again lost much of its luster, falling to fifty-six on a 100-point scale in inspections from the United States Department of Housing and Urban Development (HUD). An “E-Update” from affordable housing group The Preservation Compact described, “antiquated design, inattentive management, and poor tenant-owner relations contributed to two failed HUD inspections, and ultimately brought the 504-unit property into foreclosure.” In 2008, the area received new attention after a Boston Globe exposé on then-Presidential hopeful Barack Obama revealed his complicated relationship with Chicago’s low-income housing. The article focused on Obama’s status as a supporter of many of the same housing development organizations (like WPIC) that, through mismanagement, led to the foreclosure of Grove Parc and other properties. That same year, organizers at Southside Together Organizing for Power (STOP) worked with tenants at the Grove Parc area (now organized under the Grove Parc Tenants Association, or GPTA), who were concerned about the preservation of their homes, to find new management with whom they could work to avoid displacement. They came across Preservation of Affordable Housing (POAH), a Boston-based organization that became a familiar face in the Woodlawn community after buying the property. The organization’s purpose is to “stabilize and maintain at-risk affordable properties as vibrant, healthy homes for low-income residents,” including developments for the disabled and seniors just as much as the economically disadvantaged. POAH primarily works in Boston, Rhode Island, Maryland and other locations in the northeast. While they had done work in the Midwest before, including a housing development in Missouri, this was the group’s first acquisition in Chicago. Once hired, POAH originally intended to start fresh with the area: the same 2008 Boston Globe article describes the organization’s efforts to buy the Grove Parc development, as well as its plans to demolish the properties and construct new buildings. But a working relationship with current tenants and Woodlawn residents led to a shift in policy: by 2010, POAH was creating an explicitly mixed-income community, working to rehabilitate existing apartments and shift existing subsidies to new units once built. Later, a written agreement between GPTA and POAH from April 2015 promised “Good paying jobs for Grove Park and Woodlawn Residents,” “[Preservation of] all subsidized units,” a public operating budget provided to GPTA, and a hiring and training program conducted with GPTA’s involvement. For these tenants, the prospect of economic opportunity is just as important as the development itself. POAH is in the process of implementing each of the points in the agreement, most prominently with a Family Opportunity Center open to the entire Woodlawn community that helps people find jobs and get prepared for them. In 2015, the center placed 112 people in jobs. As early as 2005, the promotion of housing has been a key part of Woodlawn’s 21st-century civic redevelopment project. A report in 2005 from Chicago’s New Communities Program, titled “Woodlawn: Rebuilding the Village,” outlined eight different strategies for securing the future of Woodlawn. Some of these have come to fruition while others have fallen by the wayside, but the first strategy, which focuses on rental reinvestment, improvement in the Grove Parc area, and senior living options, particularly reflects POAH’s goals. But POAH’s strategies for redevelopment, even if they strive towards a goal that has stayed constant for a decade, have had to contend with a different housing landscape than that of 2005. The 2008 housing crisis in particular has left undeniable imprints in community members and developers alike, serving as a reminder of the perils that development can hold when jobs and economic opportunity fail to accompany it. Although the crisis never directly impacted the Grove Parc area, it devastated much of the West Woodlawn homeowner community, leaving some blocks of apartments empty and unoccupied. Many Woodlawn homeowners are still wary of the new Grove Parc development, seeing in the Cottage Grove apartments the echoes of both development overreach and past Chicago housing failures. The HUD study also emphasized that proper management of the properties and well-staffed security “is critical to building a shared culture within the development.” Before any greater plans for community integration or work on a more comprehensive path to employment are implemented, it’s the basic managerial needs that are key. Since many of the properties have only opened recently, it’s still unclear how effective POAH will be at establishing that culture in the long run. POAH, along with the Grove Parc residents and STOP, hopes to work through any skepticism about their commitment to the area with a more hands-on approach to the development, one that goes beyond their role as simply “preserving affordable housing” into community development. “Housing poor people isn’t the problem,” Eager says. “Good property management is the problem.” Rather than work from an entirely top-down perspective, POAH and the property managers want to be as directly involved with their tenants as possible. Eager mentions that many of the tenants have his phone number and email, and that any security trouble in the communities usually comes on his desk within a day of the event. Between the collaboration with tenants, block club members, and involved citizens, and the leeway offered by a 2011 “Choice Neighborhoods Initiative Grant” of more than $30 million from HUD (the first of its kind), POAH has worked on many levels to ground its goals for the Woodlawn community in action. Most significantly, a community organization called the Woodlawn Resource Center, works on POAH’s behalf to bring services like G.E.D. classes and counseling to Woodlawn residents, as well as to demonstrate POAH’s commitment to improving the circumstances of residents in the neighborhood. This is something of a change from 2011, when a West Woodlawn newsletter read in all capital letters “ARE YOU AWARE THAT WEST WOODLAWN WILL BE THE FIRST COMMUNITY TO REBUILD THE PROJECTS,” in reference to POAH’s work. Given all of these debates over policy, economics, community management and housing development, it’s a little surprising to see the Woodlawn Park site itself. The buildings are sparsely decorated, unobtrusive, but friendly enough, and any doubts about the quality of security are swiftly squashed by on-duty guards, who have to give you permission before you can enter any of the buildings. Residents mill in and out on their way to work, or to visit a friend. A conversation with Terry Brown, a resident at the Grant on 63rd and Cottage Grove, makes it clear just how far in the background much of this tension is to residents. As one of Grove Parc’s original residents, Brown has seen all the hands the property has moved through, and seems plenty satisfied with the current state of affairs. “It’s the same people, but there’s a new environment,” Brown says, “except with some new friends.” He has no patience for any hand-wringing about the quality of life at the new developments, calling it like “night and day.” But when asked whether he feels like the development was successful, he seemed to be more ambivalent. “You just take it day by day,” he says—a far cry from the world of four-letter organizations and ten-year redevelopment goals. On March 19, POAH presented at the annual Woodlawn Community Summit, where business and community leaders gathered to discuss the issues that affect the Woodlawn area. 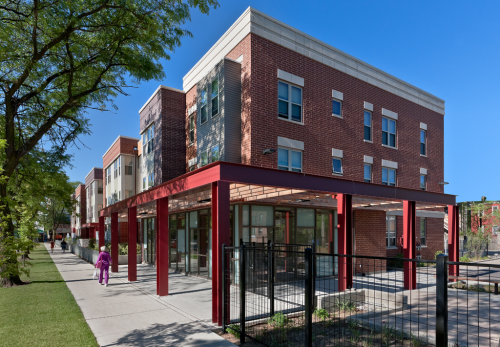 In addition to their Woodlawn Park projects, POAH also presented their new initiative “Renew Woodlawn,” a reclamation project meant to promote home ownership and the redevelopment of buildings hit hard by the recession. The project takes houses that are currently without owners and rehabilitates them, hoping to bring more and more stable homeowners to the area. It’s more likely to put those like Howard and his fellow citizens in Woodlawn Home Owners at ease, but the question of whether the new Woodlawn Park developments will last, and whether integration will be possible—that is to say, whether “mixed housing” will be a silver bullet for Chicago’s poverty woes—will only be revealed in years to come.